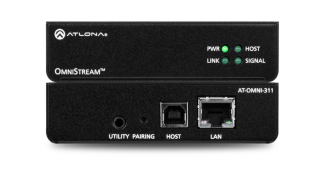 The What: Atlona has begun shipping the OMNI-311 and OMNI-324 USB-over-IP extenders. The devices work in tandem, extending USB from peripheral devices to a PC over Gigabit Ethernet. The What Else: The extenders are engineered to enable flexible design and scalable AV systems in combination with OmniStream AV encoders and decoders. The AT-OMNI-311 USB-to-IP adapter for host devices extends USB over Gigabit Ethernet using Cat-5e/6 cable, features a USB host connection for PC, and is compatible with USB 2.0 data rates up to 480Mbps. The AT-OMNI-324 IP-to-USB adapter for peripheral devices extends USB over Gigabit Ethernet using Cat-5e/6 cable, features a four-port USB hub, supports high-bandwidth devices such as webcams and speakers, as well as standard HID class peripherals, and is also compatible with USB 2.0 data rates up to 480Mbps. The Bottom Line: The OMNI-311 and OMNI-324 are designed for meeting room applications with high-bandwidth devices including cameras, speakerphones, microphones, and DSPs, plus standard USB HID-class devices such as a keyboard, mouse, or touch display.